In this work we propose an adversarial learning approach to generate high resolution MRI scans from low resolution images. The architecture, based on the SRGAN model, adopts 3D convolutions to exploit volumetric information. For the discriminator, the adversarial loss uses least squares in order to stabilize the training. For the generator, the loss function is a combination of a least squares adversarial loss and a content term based on mean square error and image gradients in order to improve the quality of the generated images. We explore different solutions for the up sampling phase. We present promising results that improve classical interpolation, showing the potential of the approach for 3D medical imaging super-resolution. 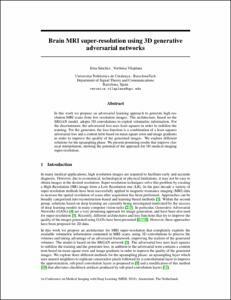 Sánchez, I., Vilaplana, V. Brain MRI super-resolution using generative adversarial networks. A: International conference on Medical Imaging with Deep Learning. "International conference on Medical Imaging with Deep Learning: Amsterdam, 4 - 6th July 2018". 2018, p. 1-8.